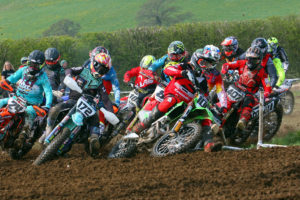 GasGas UK rider Gethin Humphreys made it 3 wins on the trot in the new W-E-S 2019 event (6 in all competitions) last weekend at one of WOR’s fantastic new venues on the Rhug Estate in Corwen. Steve Ireland secured a simply fantastic venue for the weekend with a 6-mile lap of prime Hare and Hounds Enduro terrain. The course had everything, from rolling meadows, loamy woodlands, forest fire roads, sandy , dusty berms the size of a small house and some big natural jump sections for the spectators to gather around and all this was hosted in one of the most scenic and picturesque settings you could imagine.